I generally dislike autobiographical business books, but Setting the Table was different. Autobiographies typically start strong, but at some point turn into a self-congratulatory victory lap with the author patting themselves on the back (or defending questionable business practices). I get that only the successful entrepreneurs are going to write the popular books, but that doesn’t mean you have to talk about how great you are over and over. Meyer does a great job staying impartial and telling the story like it is. He doesn’t brag about his success. He doesn’t embellish. You get more from his story because he shares more than just his success stories. He shares his failures, what he learned from them, and how he used those lessons to strengthen his resolve to succeed. He shares his foibles and the mistakes he made along the way. He shares the advice told to him by his mentors and others who helped him. In other words, the tone of the book is genuine. It feels like you are having a dinner conversation with Danny about the history of Union Square Hospitality Group at one of his restaurants. Ultimately, the most successful business is not the one that eliminates the most problems. It’s the one that becomes most expert at finding imaginative solutions to address those problems. In business, we can get caught up trying to eliminate problems rather than coming up with creative solutions to solve them. That is what successful business are all about. Meyer illustrates this point with the “off-center salt shaker” story one of his mentors taught him. The lesson is that customers will always push you off your desired center. Don’t fight it. Embrace it, and learn to turn your ability to solve customer problems into a strength. I also learned to manage expectation – and to plan for success, not just for failure. Too often, we’ve made mistakes by not anticipating what the consequences would be if we were to win. This is an important lesson for business and life. We can spend too much of our time on the ‘what-ifs’ in case we fail, which often brings about exactly what we fear. When you focus on and plan for success, the difference is amazing. A simple change in mindset has a profound affect on the outcomes and trajectory of our business, and life. The only way a company can grow, stay true to its soul, and remain consistently successful is to attract, hire, and keep great people. Meyer spends a large portion of the book talking about hiring, leading, and managing people, as he should. His lessons aren’t just for the hospitality business either. His people philosophies apply to business of all types, shapes and sizes if they want to succeed for the long-term. As noted in lesson #3, without happy, motivated and dedicated employees, it is very hard for a business to succeed. A business has to first take care of its employees, and then its customers, and then everyone else to achieve lasting success. As a business book, Setting the Table is a Must Read. It applies to all businesses, whether you are in the hospitality sector or not, whether your business is big or small, or whether you are just starting out or established. The lessons and guidance are universal truths in business, and ones that I hope to incorporate into the fabric of my own company. The best way to wrap up this review is by sharing my experience at one of Danny Meyer’s restaurants. Shortly after finishing the book, I had the opportunity to travel to New York City on business. As part of the trip, I was intent on visiting one of Meyer’s restaurants. 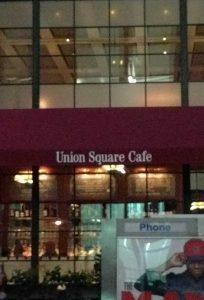 I figured what better place to go than his first restaurant, Union Square Cafe. I got to experience, first-hand, all of the philosophies that Meyer talked about in the book. It didn’t disappoint. The restaurant may have moved from its original location on E. 16th Street to 19th Street and Park Avenue South, but the hospitality is still top notch. I received excellent service from everyone on staff, and it didn’t hurt that the food was amazing. The prices on the menu are higher than you would expect, but they are offset by a “no-tipping” policy. Therefore, the overall cost of the dinner was the same. Quite honestly, all restaurants should adopt this philosophy. It makes for a better overall dining experience. 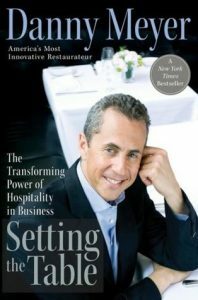 Once again, Danny Meyer isn’t afraid to step outside the box and try new things in his business.